SAN JOSE, Calif. -- Three current and former high-profile Mixed Martial Arts (MMA) fighters filed a multi-million-dollar class-action lawsuit today against the Ultimate Fighting Championship (UFC) organization, accusing the $2-billion outfit of illegally maintaining monopoly and monoposony power by systematically eliminating competition from rival promoters, artificially suppressing fighters’ earnings from bouts and merchandising, and marketing activities through restrictive contracting and other exclusionary practices. The civil action – Cung Le, et al. v. Zuffa, LLC, d/b/a Ultimate Fighting Championship and UFC– filed today in the U.S. District Court for the Northern District of California in San Jose, seeks treble damages and injunctive relief under the Sherman Antitrust Act stemming from the UFC’s alleged “over-arching, anti-competitive scheme to enhance its monopoly power” in the market for promotion of live Elite Professional MMA bouts, and monopsony power in the market for live Elite Professional MMA Fighter services in the United States. Monopsony refers to when there are many “sellers” and few “buyers” in the marketplace. The lawsuit filed by fighters Cung Le, Nathan Quarry and Jon Fitch, who seek to represent a class of similarly situated current and former UFC professional combatants, alleges that the plaintiffs are victims of the UFC’s illegal scheme to eliminate its competition in the sport of MMA and suppress compensation for UFC Fighters from bouts and fighter identities and likenesses. The lawsuit claims that the UFC’s alleged anti-competitive acts, in particular its actions over a period of years, have made and maintained the UFC as the only option for MMA fighters who want to earn a viable living in the profession. Above all, the lawsuit alleges that the UFC prevents fighters from working with other MMA promoters, mounting self-promotional efforts of their own or signing with outside sponsors – monopolistic practices that suppress fighters’ incomes. The lawsuit alleges that the UFC has pursued an aggressive strategy of depriving key inputs to potential rival promoters or merging with them to maintain its monopoly position. The complaint alleges an “exclusionary scheme” to impair and foreclose competition, whereby the UFC deprives potential competitors in the fight promotion market access to elite MMA fighters, premium live event venues and sponsors. The lawsuit alleges that as a result of these and other anti-competitive acts, including the UFC’s acquisition of rival Strikeforce, the UFC has maintained control of more than 90 percent of the revenue derived from live MMA bouts nationwide. The lawsuit also alleges that the UFC has retaliated against fighters who have worked with or who have announced intentions to work with rival promoters or sponsors by refusing to book their bouts and/or eliminating them from key UFC promotional activities such as advertising campaigns and video games. The plaintiffs are represented by nationally respected antitrust litigation firms Cohen Milstein Sellers and Toll PLLC, Berger & Montague, P.C.,Joseph Saveri Law Firm, Inc. and Warner Angle Hallam Jackson & Formanek, PLC. For more information about Cung Le, et al v. Zuffa, LLC, d/b/a Ultimate Fighting Championship and UFC,visit http://www.cohenmilstein.com/news.php?NewsID=742. Editor's Note: We will be writing MUCH more about this case as it develops. Look for more information within 48 hours as we examine the entire complaint and analyze what kind of legal hope this litigation has to succeed. 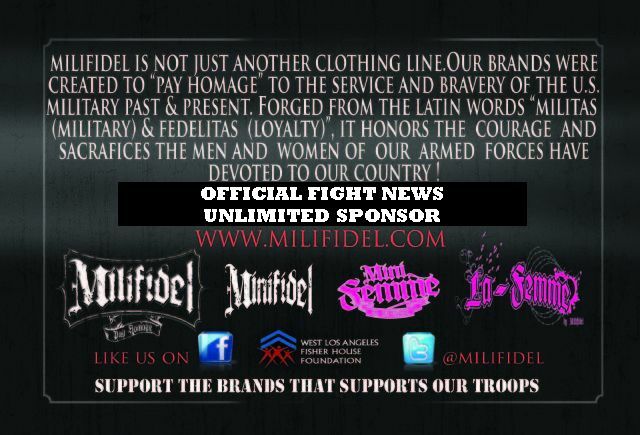 Contact us at info@unlimitedfightnews.com to send us news, find out more about sponsorship opportunities, and inquire about link exchanges. Home fitness program: The Spartan workout routine and nutrition plan. UK Bodybuilding Supplements: One of the most comprehensive, user friendly and up to date bodybuilding supplement websites. Jiu-Jitsu and Strength Academy (JSA) offers beginner and advanced classes in Brazilian Jiu-Jitsu, real world self-defense, and strength and fitness training, in group or individual settings. Instruction is led by Rafael “Formiga” Barbosa, a 2x IBJJF World’s Masters champion. Come check us out! Free Bodybuilding eBooks:Download the best free bodybuilding ebooks.